The game was AERIAL ASSIST. Early in the build season our robot resembled a bug from a popular animated movie, and “Flik” was born! Little did we know that “Flik” would have the distinction of becoming our most traveled robot. Our team traveled to the inaugural Central Illinois Regional held, in what was affectionately nicknamed, “The Snow Globe”. The building itself was quite chilly, but Pekin, Illinois did an outstanding job of providing a warm welcome. Custom street signs could be found throughout the city. Team signs were arranged outside the dome in order of distance traveled. Matches were much more aggressive than we imagined. Our team was ranked #1 with a record of 17-2-0. We partnered with team 1986 and team 4296 to win the event. Our team was honored to receive the Innovation in Control Award. 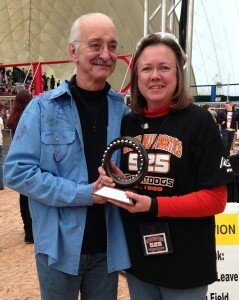 Jan Newendorp became the 3rd Swartdog mentor to receive the prestigious Woodie Flowers Finalist Award and was humbled to receive the award from Woodie Flowers himself. In March we traveled to Cincinnati for the Queen City Regional. With a very tough schedule and unforeseen mechanical problems we lost in the quarterfinals. We were honored to receive our second Innovation in Control Award. As a result of chance meeting with a businessman from China two years ago at the championship, our team has enjoyed an ongoing relationship with new FRC teams in China. Several of our mentors traveled to China in December to lead a mentor workshop. In August Flik was crated and sent to Hong Kong. Our team joined him for the first ever Chinese FRC scrimmage! 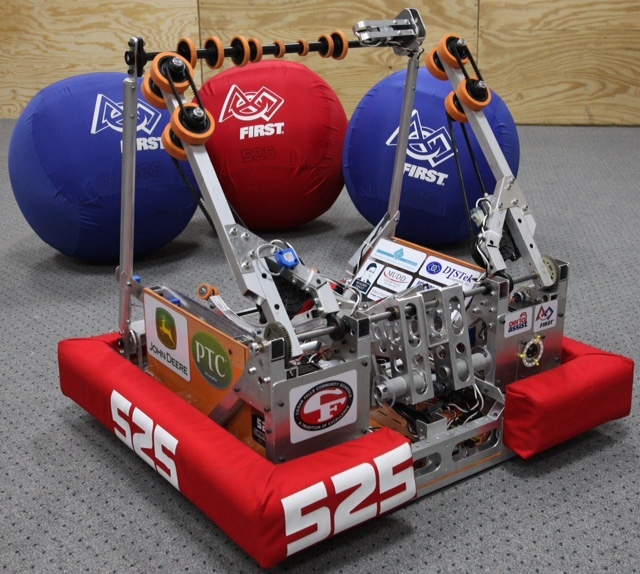 We worked closely with 3 other FRC teams from the United Stated to organize and participate in the scrimmage. Following our lead, the American teams withdrew from the eliminations, allowing the Chinese teams to have the full experience. Instead, the American teams gave demonstration matches. In October, Flik and the Swartdogs traveled to Lee’s Summit, Missouri, for our first-ever Cow Town Throwdown. This event, hosted annually by Team 1730, Team Driven, is an off-season event featuring teams from all over the midwest, competing with last season’s robot. Because of all the seniors on our drive team, we had to take a brand-new drive team. We competed well throughout the event, garnering the first pick from Team 1986, Team Titanium, with whom we partnered at the Central Illinois Regional. With 1986, 2410, and 4329, we made it all the way to the finals and won the competition! AERIAL ASSIST was played by two competing Alliances of three robots each on a flat 25’ by 54’ field, straddled by a truss suspended just over five feet above the floor. The objective was to score as many balls in goals as possible during a two minute and 30 second match. The more Alliances scored their ball in the their goals, and the more they worked together to do it, the more points their Alliance received. The match started with a 10-second Autonomous Period in which robots operated independently of drivers. Each robot started with a ball and attempted to score it in a goal. Alliances earned bonus points for scoring balls in this mode and for any of their robots that moved into their zones. Additionally, each high/low pair of goals were designated ”hot” for five seconds, but the order of which side was first was randomized. For each ball scored in a “hot” goal, the Alliance earned additional bonus points. For the remainder of the match, drivers remotely controlled robots from behind a protective wall. Once all balls in autonomous were scored, only ball was re-entered in to play, and the Alliances had to cycle a single ball as many times as possible for the remainder of the match. With the single ball, they tried to maximize their points by throwing balls over the truss, catching balls launched over the truss, and scoring in the high and low goals on the far side of the field. Alliances received large bonuses for “assists,” which were earned for each robot that had possession of the ball in a zone as the ball moved down the field.